It is too mainstream sometimes to go where every else goes, to think of it there must be so many different destinations in the country that one hasn’t possibly explored. We are here to help you select good holiday destinations close to Delhi that aren’t frequented by many; you can now be far from the madding crowd. Here are some off-beat destinations, just a getaways from Delhi. Kausani: 390 km from Delhi, this picturesque hill station is often referred to as, ‘Mini Switzerland of India’. Sadly not many have been able to explore it, but this is good for you as you can be at peace with nature here. Here you will also find the 'Anashakti Ashram', it is a place where Mahatma Gandhi spent some of his days and wrote his commentary of Anashkti Yog. So, good place to seek peace! Shoghi: Once the unexplored village in the North Indian state of Himachal Pradesh, this village lies 13 km before Shimla and sits on the Ambala-Shimla highway. Tourists ignore this small village and move ahead for the real taste of hills, which is Shimla. The scenic beauty and natural landscape make it a promising tourist spot. Shoghi is located at a distance of 343 km from Delhi on Ambala Shimla National Highway. Binsar: A small hill station in Almora district, the Binsar Wildlife Sanctuary is the most popular attraction of the town. Binsar is situated at an elevation of 2400 mtr above sea level and is one of the highest Hill stations in the Kumaon region. It is perfect for a weekend getaways delhi, a beautiful, wild, and quiet Himalayan destination with rich natural surroundings nested in the dense forest. Munsiyari: A place famous for trekking and mountaineering, people who are interested in adventure sports know about this place. It is the base camp for various mountaineering and trekking expeditions that take place in Himalayan range. But people generally are unaware of its existence and about its scenic beauty and fascinating landscape. Munsiyari is located at a distance of 650 Km from Delhi and is approximately 125 Km from ahead of Pithoragarh. The best time to visit Munsiyari is from March to June & September to October, and it is not really recommended for monsoon. Galta: This place located 260 km away from Delhi and just 10 km away from Jaipur is beyond the Sisodha Rani-ka Bagh on the Agra Road. This place is essentially a pilgrimage spot. The temple this place is famous for being the Galtaji temple, which is situated beside a natural spring. The temple is made of pink stones and is dedicated to the sun God. The spring that you will find near the temple is a holy bathing spot, and it supposedly cleanses one’s sins. You can visit this place during the mild winter months. Rohru: About a 100 km from Shimla, the peaceful town of Rohru is a perfect summer retreat. If you are looking to get away from the heat and chaos, then don’t look any further. 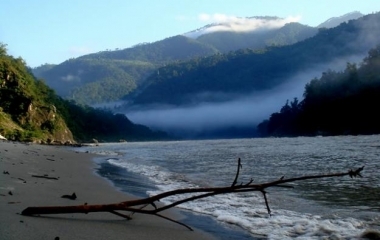 The place is well known for fishing on the banks of the Pabbar River. You can also enjoy camping, gliding and trekking in this region. During the winters, visit Rohru to experience snow. So, if you want to take a break from your routine and step out of Delhi over a weekend, check out the places listed above.